Even on vacation bananas go brown. Not like I didn’t think it wouldn’t happen, it’s warmer here plus we’ve been too busy playing to eat them right away. Needless to say, I couldn’t store them in the freezer for another time and I certainly didn’t want to throw them away. 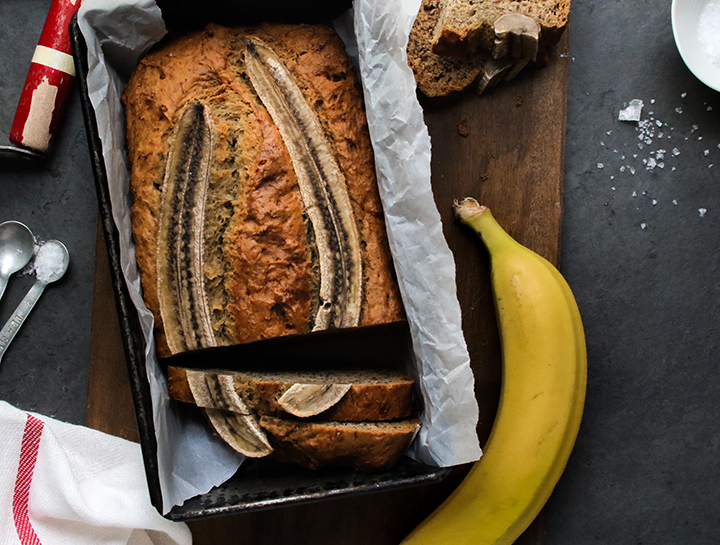 Thankfully I have a tried and true recipe for this super quick banana bread that’s the go-to with overripe bananas. With a few pantry items, I was back on the beach in no time. …And yes, I even bake on vacation…. This recipe has been tops on the site for almost a decade - and for good reason! It's amazing and it really is super quick! This batter can come together faster than your oven can heat to 350º. So if you have a few minutes and some spotty bananas, give it a try! Mash the bananas well and combine them with the butter and the sugars to cream. Add vanilla. Add the salt, baking powder, baking soda and cinnamon to combine. Stir in each of the flours, mixing until just moistened. Bake in a slightly greased and flour dusted loaf pan for 35-40 minutes of until a cake tester comes out clean. Let rest for a few minutes before removing from the pan to cool on a wire rack. For something a little fancier, drizzle over some cooled caramel and serve it for dessert!